Of course, taking the settings from the hood, I used Lux cloth with Silk_charmeuse, diffuse warp and weft set to pale pink 255,180,213, specular warp and weft 187,187,187. UV thread count to 500 for both. Following an example render in Rogerbee's thread I thought I'd share some presets with you guys for image based lighting solutions. These IBL presets don't merely light your scene, but can also act as a backdrop to add skies and other detail without the need for skydomes which might otherwise extend rendering times. Each preset has a 'sun' positioned to line up with the IBL for more accurate shadows and lighting, as well as a textured sphere to act as a guide for positioning your light appropriately. The sphere is set to a null material so it won't appear in your render and is merely there as a guide. Without further ado, here are the links. Lastly, there is a metadata file you can use to add these to your smart content. Installation instructions included. Woohoo! A place to start! I've been wanting to learn how to make good-looking cloth, and haven't really tried yet because I feel rather clueless with Lux still. Thanks! Now I'm going to go play. Good luck, the clue in using the cloth is in the thread count, different cloths have higher or lower thread counts. LuxRender Silk charmuese cloth with a pale pink diffuse colour. Where do you find these materials please? 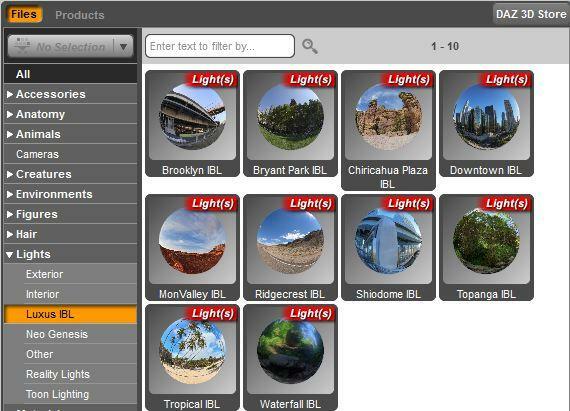 There part of Luxrender, you need the plugin LUXUS. I have Luxus, but how do you find these materials? I can't see anything that mentions them. See attached image. Its the cloth material. 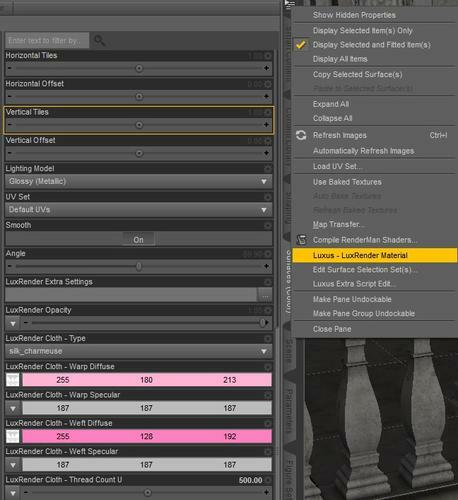 This exact LuxRender/Luxus material can be found in the smart content > shaders > fabric. You can get the same or similar effect (not sure if there are any custom texture maps at play there) using the cloth preset from the Luxus material selector popup. Ah, beaten to it! Should know better than to get in the middle of a conversation without reading timestamps. Thanks for putting these together. Thanks for these, but when I render my image all of the IBL image appears in my render. This happens with all of them. That's actually intentional. However, the image isn't coming from the sphere, it's actually coming from an environment map light. If you export with alpha channels you'll notice that the background vanishes, so you can use it both to add skydomes or export with alpha and postwork in your own backgrounds. Here's a quick and dirty example. The image on the left is default IBL without exporting alpha. The one on the right I exported with alpha intact (an option in the Luxrender GUI) and postworked a simple sky background in. I couldnt get the meta data to work. I copy/pasted it to the correct dir but nothing is showing smart content after database update. It should work fine. What directory did you unzip the files to? The IBLS show in the content library but not in the smart content. Just a question: is there a reason for the absolute noncommercial use? Not even commercial renders, like contests? The zip file already has a 'studio4' directory set, so unzip it directly to the DAZ 3D directory (one level up). Alternatively, drag and drop the two files (dsx and dsa) into the RunOnce folder in the Studio4 directory. That's actually a limitation of the IBL files used, unfortunately. Without special permissions from the author they're not to be used for commercial purposes.The exact license detail can be found here, and while it allows distribution and even alteration of the work it also explicitly states non-commercial purposes only. Sorry. I see! Thank you for that information. Tried that, still no go. What smart content dir are they supposed to be because if they are there then I can not find them. The IBL's themselves are saved in 'Props\HeraldOfFire\Luxus IBL', so you should find them in the Content Library under 'Daz Studio Formats -> Props -> HeraldOfFire'. 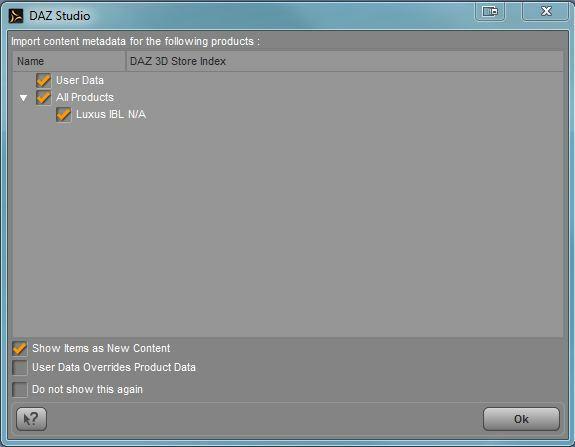 As for the metadata, it should give you a dialogue box upon loading Daz Studio similar to the one illustrated below which I did on a test machine to check the metadata installer. If you're not getting this message, then the metadata is not being installed correctly. 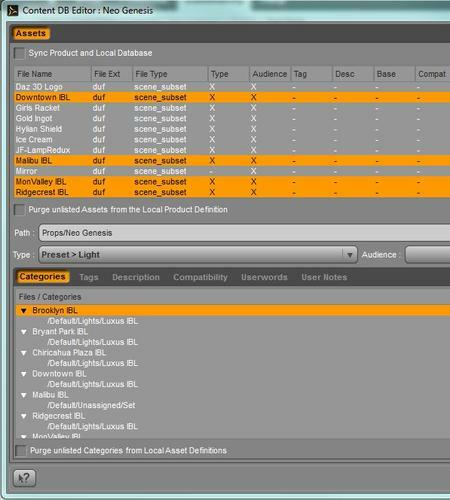 When correctly installed, the presets can be found under Lights -> Luxus IBL. Like I said I can find them in the content library, I also get the requester from the database management but they not showing in my smart content. Dont know whats going on. Find them in the content library and right click the Content LIbrary tab. Choose Content DB Editor. Select the files and expand them in the lower window under "categories" and then screenshot it for me. What should be listed is 'Default/Lights/Luxus IBL', if anything else is showing then something has gone awry. 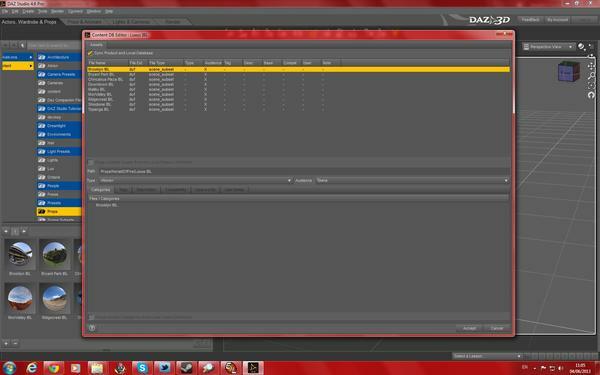 And you're certain that you got the database dialogue box when loading Daz Studio? Looking at the image you supplied, no metadata was loaded at all for them which is truly perplexing. I've only tried it on the one test machine so far, but it loaded up correctly so I assume everything should work fine. Is anyone else having issues loading the metadata in? If it's a widespread issue then there might be something very wrong with the files rather than the installation. My screen is exactly the same as Michael_G's. Nothing shows up in Smart Content. Seams you got the same problem, I was just about to some pics for you Herald, showing you what I was doing but looks like I don`t need too.